In the second year of the Master in Creative Writing, I started writing what would become my first novel, Rus Like Everyone Else. There was no plan, I only had a few characters that had slowly emerged from my experience living in Amsterdam and London. Those characters had been wandering around inside my head for a while and their stories seemed to be connected somehow. There was a lonely secretary waiting for her life to start, an elderly man with agoraphobia, a granny with a soap-opera addiction, a young immigrant trying to make it, and Rus, a young man who had to start taking part in society after living the first twenty five years of his life under the radar. I was living on a small farm in Devon when I began writing the novel, where I helped with the horses in the morning and tuned into the city-life of my characters in the afternoon. At first I was worried that being in the countryside I would only get ideas for stories about fields and horses, but the distance to my everyday life gave me the space to fantasize and create a fictional city. 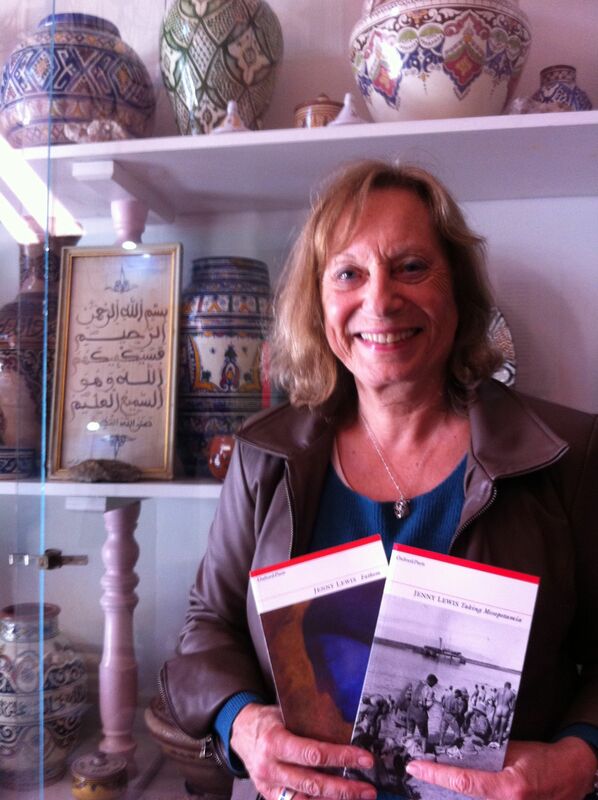 ‘Every beautiful poem is an act of resistance’ – MSt Tutor Jenny Lewis at the Al Kalima International Forum of Poetry, Morocco, March 2015. ‘Every beautiful poem is an act of resistance’: reflections on a voyage poétique. For every physical journey there is an accompanying internal, psychological and spiritual one and my trip to the Third Rencontre Internationale de la Poésie in Morocco this month was no exception. The fact that the festival theme this year was ‘poetry and resistance’ was the reason I had been invited. Since the publication of my book Taking Mesopotamia (Oxford Poets/ Carcanet, 2014) I have been categorized as a contemporary war poet, tackling themes of resistance and dissent. The fact that I have a growing body of poetry translated into Arabic (with the help of the Iraqi poet Adnan al-Sayegh) has also given me a passport to Arabic-speaking festivals and is a key factor in opening doors to a wider international readership. Over the eight days of the festival I and the other 22 poets from 15 countries gave 12 readings and took part in round table discussions on where the poetry of dissent is taking us in the continuing aftermath of the 2003-2011 Iraq War. My book started as a search for my lost father who fought with the South Wales Borderers in Mesopotamia-Iraq in the First World War and died when I was a few months old at the end of the Second World War. Because of this it is deeply personal to me and the fact that poems from the book shared the same forum as the work of great activists such as André Breton, Yannis Ritsos and Mahmoud Darwish – not to mention the other poets I was travelling with – gave me a sense of a validation. A core theme of the debates and round table discussions was the importance of moderation in the revolutionary discourse, reflecting Mahmoud Darwish’s assertion that ‘every beautiful poem is an act of resistance’ and Adonis’ belief that focusing on the artistic aspects of poetry is a more effective way of educating people than propaganda, and a better way to serve the nation than more aggressive forms of resistance. Writers need an acute attentiveness to language when reading, and a self-consciousness when writing, which together foster a creative use of words. It is only an imaginative use of language that allows for new ideas and for a new understanding of ourselves and the world we live in. We need to be linguistically inventive and ingenious if new insights are to be conceived of, and articulated. And we also need to be aware of language that is no longer fit for purpose. We need to do something about words which have lost their vivacity and lounge lazily on the page. The term ‘verbicide’ (the killing of words) emerged in the mid-nineteenth century. In the twenty-first century it is cliché that needs to be in our sights. Belinda Jack’s first two books are on francophone writing. She then wrote a biography of George Sand, George Sand: A Woman’s Life Writ Large and a group biography, Beatrice’s Spell. Her most recent book is a history of women’s reading, The Woman Reader, published by Yale University Press. She is a Student (‘Fellow’) and Tutor in French at Christ Church and is currently Gresham Professor of Rhetoric at Gresham College, London. The title of her three-year lecture series is ‘The Mysteries of Reading and Writing. Belinda Jack also writes for a number of periodicals, reviews widely and speaks at literary festivals and on the radio.